Where are you from? Your profession? I live in the Kansas City area, and also lived in Dallas for many years. I work as a consultant to very small businesses who do not have internal marketing, promotions, and business support services. When and how did you become interested in paddling? I first tried paddling at an event with a local women's outdoor group about eight years ago. I loved it immediately, bought a recreational kayak, and have been paddling regularly since then. I founded Paddle KC kayak and SUP paddling club in January of 2015 after several years of hosting paddling outings in the Kansas City area. The focus of Paddle KC is to get together on the water to enjoy paddling experiences, increase paddling skills, and grow connections with other kayaking, paddleboarding, and canoeing enthusiasts who own their gear and are ready to go. Too many people paddle alone, learn things the hard way (like I did when starting out! ), and are unaware of important safety considerations for paddleboarding or kayaking. Joining Paddle KC helps new and experienced paddlers enjoy this fantastic hobby more. 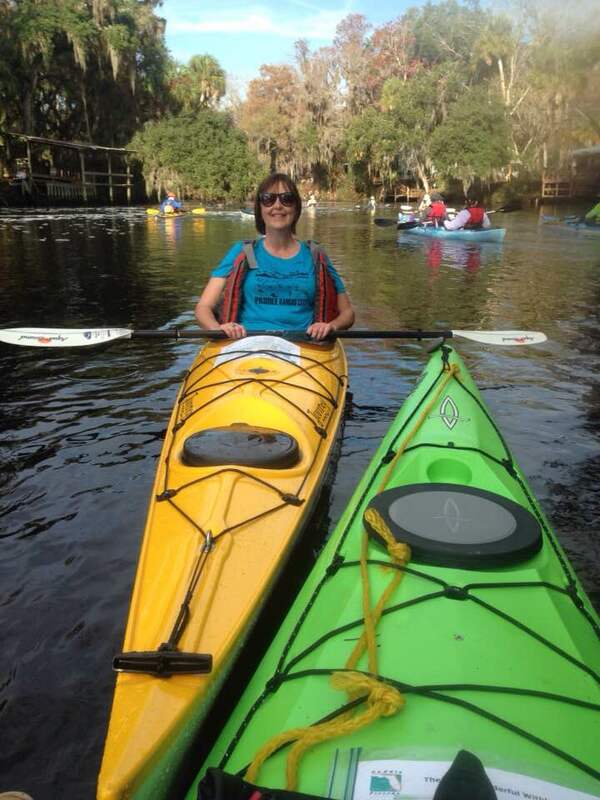 I learned of Paddle Florida from one of our members who goes on Paddle Florida trips every year. Where is your favorite place to paddle? I have many favorites, for many different reasons. Most of all, I just love exploring throughout the year. I visit many Missouri and Kansas lakes and rivers near Kansas City. I look for areas of lakes with lots of inlets and feeder creeks for great views of wildlife and protection from possible winds. The Missouri River at Kansas City is an interesting "big river" experience, with iconic views of the downtown skyline and the underside of familiar bridges. The Current River, Jacks Fork River, and Eleven Point River are all beautiful Missouri Ozarks rivers with mild but fun Class I & II rapids. One of my all-time favorites that I visit every year is the spectacular Buffalo National River in Arkansas, with 500-foot cliffs, cold-water springs, waterfalls, rolling hills along the river, and plenty of sandbars for kayak camping. Last New Year's Eve, I really enjoyed paddling the Current River. It was 8 degrees and the river was beautiful, with steam rising off the river and giant icicles hanging from steep rock cliffs along the banks. I ended up with icicles on my paddle and cockpit edges. What's the most interesting thing that ever happened to you on a paddling trip? I host an annual visit to a 150-acre underground lake in a flooded mining cave that operated from late 1800s to 1950s. That whole experience is interesting. We camp in a giant cave with 30-40 friends, paddle the underground lake in total darkness except for our headlamps and a couple of spots with holes to the sky, and do a scavenger hunt by headlamp in kayaks to find prizes bobbing in dark corners. Last time, the cave guide led me into a "squeeze box" where I had to scoot down into my kayak and turn my head sideways to avoid hitting my head. You know it's tight quarters when you are squeezed down as much as possible, with head turned to the side, and you scrape your cheek on the cave ceiling! It's a very cool, unique experience to paddle underground. Which Paddle Florida trip(s) have you gone on? Wild and Wonderful Withlacoochee, 2018. Fantastic experience! This was my first experience on a trip with gear transport, provided meals, and evening entertainment and it added SO much. Can you describe a Paddle Florida trip highlight? I loved every bit of it! The varied scenery and wildlife along the Withlacoochee, the great shared meals, the interesting and entertaining nightly entertainment, and the cool people. I really enjoyed paddling the creek area with fallen trees that required climbing over from boats in the water. And the rainbow over our camp at the final campsite was a nice touch! What advice do you have for folks considering a Paddle Florida trip? Just Do It. You'll be glad you did.